Jennifer Maglalang is the director for admissions for the School of Social Work. Her primary social work interests are working with diverse populations around community building/engagement and education. These interests tie nicely to her past role as instructor of Community Service Learning, where undergraduates in the BASW program engage in community service learning internships at local nonprofits. 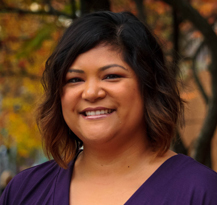 Jennifer received her MSW in 2002 from the UW School of Social Work after completing her undergraduate studies in Interdisciplinary Arts and Sciences, American Studies. Prior to her work at the School she spent several years doing neighborhood community development, youth development, program planning, evaluation and supervision, primarily within refugee and immigrant communities in South King County. Jennifer was also the co-founder of ReachOut, a cultural competency and community engagement training program for K-12 educators and nonprofits. As a professional development trainer she supported educators and social service providers in enhancing their capacity to serve diverse communities in culturally respectful and meaningful ways. Jennifer has also served as a practicum instructor for masters and undergraduate social work students, adviser to first year masters students, and mentors high school age students of color in their pursuits of higher education.